One Is Not Like The Other was made after having moved back into my family home following the completion of my university degree. There I started to think about the word ‘identity’ and what might have had some affect on mine. Francis Galton’s phrase ‘Nature versus Nurture’ talks about two things that have an influence on whom we become as human beings; it is a continual debate with people favouring one over the other. I believe that my family have had an impact on both, causing an effect on myself. My family relocated from the suburbs of Birmingham when I was seven to the edge of the countryside; as a result I often wonder what my life might be like now if we hadn’t moved. Though my setting changed the same five people have remained throughout my life with the addition of a younger sister and the loss of my paternal grandparents. Together they are six people I am connected to regardless of how close we may be in terms of distance and socially. 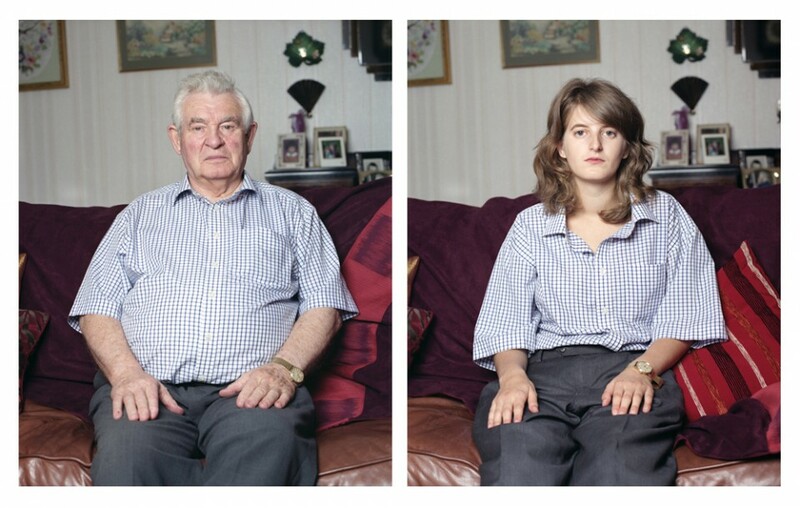 This project presents my family photographed in their own environments, whilst furniture, belongings and choice of clothing offer hints about each subject’s personality and life. By impersonating each relative I am trying to make the viewer draw on differences and similarities, whereas showing me as myself helps to give another layer by presenting a glimpse into my own persona. With my siblings and myself I chose for us to imitate each other. As offspring of our parents I find it interesting that although we come from the same two people we are still different to each other. It also touches on the nature versus nurture discussion. Despite the original and mimicking photographs being set in the same scene with identical accessories and lighting they still don’t match perfectly. In terms of them being different people that’s obvious, but there are also other quirks. The camera may not be equally aligned or a pose is slightly different. This is due to a change of camera operator and the unnaturalness of poses for some. However these variations help give other clues into who we are as people and our own separate identities. The word identity has many meanings, but for me it’s about what makes myself me. Though one may copy those who they are genetically connected to and descended from, individuality will still shine through whether it is via hints or physical differences. At 23 years old I don’t think my identity has fully been established yet. I believe it’s a changing, always evolving thing – even after death. I am a sister, daughter and granddaughter now, but will I become a mother, a grandmother or a great-great-great grandmother? Only time will tell.